← Bees like Water too! 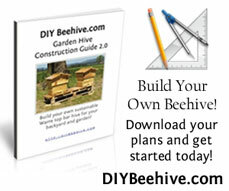 You may need some additional tools depending on how you build your hive. For instance, you can use a table saw to make the majority of your cuts. I use one since it speeds up my preparation time. Also, you may need an electric screw gun if you choose to use screws instead of nails. If you are using the free Warre hive plans to build your hive, you will notice that all of the measurements are given in centimeters with inches as a secondary measurement. When I first saw this, I went ahead and bought a metric measuring tape. It is easier for me to use the metric units than to translate all of the metric units to imperial units. A word about glue…some people feel that glue should not be used in beehives. The theory is that glue may emit gasses over time. These gasses may be harmful to the bees inhabiting the hive. On the other hand, there are some who feel that the gas effect of the glue is inconsequential compared to the strength of a glued hive. I personally do not use glue in my hives; however feel free to use some if you want to. I MANUFACTURE BOX JOINTED HIVES WITH PIERCO FRAMES FOR $50 A BOX COMPLETE! SHIPPING SEPARATE BUT WILL SHIP COMPLETELY ASSEMBLED WITH FRAMES.